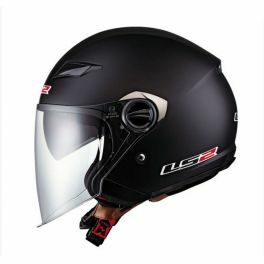 The LS2 OF569 open face motorcycle helmet is one of the most popular in our line up. When it's hot outside, it's awesome to be able to lift the shield and get some air when you're stopped at a light or filling the tank. The face shield is optically correct and flips up and out of the way when needed, and uses our ShortShift® Tool-less Quick Release for easy replacement. The peripheral vision is exceptional and allows you to see the world without the typical obstruction of other helmets. The OF569 includes LS2's Full Eclipse® Drop Down Sun Shield that engages and retracts at the touch of a button. The strap system is what really sets this apart from other open face motorcycle helmets. In addition to the regular chinstrap with quick release, there are two additional straps that secure at the back of the helmet to cradle your head and help prevent roll-off in the event of an impact. The plush comfort liner is fully removable and washable, and it's treated to resist bacteria and odor. DOT/ECE approved. OVAL FIT. Covered by a 5-year limited warranty against defects in material and workmanship. Flip-up, optically correct shield, plus built-in Full Eclipse Sun Shield make it easy to control how much air and light you want. 4-point retention strap with quick release buckle for a secure fit that will stay on your head. Adjustable, flow-through ventilation so you can have some control over the elements. HPTT composite shell and DOT/ECE approval provides added confidence. Our catalog is based upon original part numbers, so if you know the part number you need you can fill out the SEARCH field to find your product. Note that some products have options and variations. Those options are usually about finishing material (ie. chrome or black) or year/model of the motorcycle, so pay attention to make the right selection. Once you select your product click on add to cart, open the cart and finalize your shopping. LCS MOTORPARTS webstore DOES NOT provide an automatic calculation of shipping, so you will be charged by products in your cart only and shippment costs will be charged later via Paypal. If you need an estimate before buy, don't hesitate to contact us by email or calling (786) 227-6980. All return merchandise had to be made through authorization of LCS Motorparts with a RMS (Return Merchandise Authorization) number. So please, contact us about your returns before take any action. Did not find the product you need? Call us or send an email.